Regina Mare-Adults Only Hotel is located in Imerovigli and offers panoramic views of Santorini's caldera, volcano and sunset, plus free WiFi and breakfast included. The Regina mare has 20 rooms fully equipped. 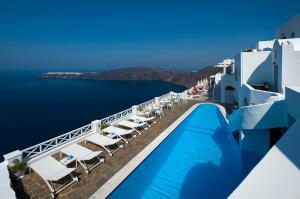 Located on the ground floor, this room has a traditional Cycladic style. It has air conditioning, a terrace right next to the pool, views of the boiler, a built-in bed, satellite TV and a hairdryer. This superior double room is more spacious and has a sofa bed and a balcony or terrace with views of the sunset and the Caldera. This spacious suite is located on the hotel's 3 floor. It has views of Caldera and a living room with integrated sofas. Upon arrival a bottle of local wine, flowers and a fruit basket are offered. This newly renovated suite is located on the top floor and offers a furnished balcony overlooking the Aegean Sea, the Caldera and the town of Oia. It includes a seating area with modern décor, a TV with satellite channels and free Wi-Fi. 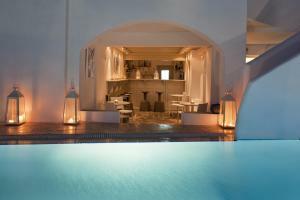 Upon arrival, guests receive a bottle of Santorini wine, a basket of fresh fruit and free sweets. This spacious suite is located on the 3 floor and features a seating area and a heated outdoor hot tub. Includes a bottle of local wine, a basket of fruits and flowers upon arrival.